Blog note: Important frequency information at the end of this article. CHRISTCHURCH, New Zealand (AFPN) -- Operation Deep Freeze 2007-08 winter flights began Aug. 20 ending more than five months of isolation for the research station as the first C-17 Globemaster III delivered passengers and cargo to McMurdo Station, Antarctica. Landing 15 miles from McMurdo Station at Pegasus Runway, the C-17s will carry in scientists and support members to start early pre-summer projects, augment maintenance personnel and prepare skyways and ice runways at McMurdo Station. Winter fly-in, called WinFly, is the first of three phases for Operation Deep Freeze that sets the stage for the U.S. Antarctic Program. "We bring people down that will begin construction on what is called the 'annual sea ice' runway, which is very close to McMurdo," said Lt. Col. Jim McGann, the 304th Expeditionary Airlift Squadron commander. When people arrive at Antarctica, they have to take about an hour trip from Pegasus Runway to McMurdo Station. Once the 10,000 feet by 220 feet annual sea ice runway is completed, the trip will be just 10 minutes that allows quicker downloads and less exposure to the weather. "We like it because they build us a nice runway. They like it because the C-17 is closer and it makes the travel time a lot quicker," Colonel McGann said. Operation Deep Freeze is a demanding mission due to the extreme adversity of the environment and remoteness of Antarctica. For WinFly, and for all of the seasons, there are few options. The C-17 carries unusual loads and has to deal with weather that can change in 30 minutes. To meet the challenges, a joint force of active-duty and Reserve members are assembled to complete the difficult tasks safely and efficiently. "My pilots are picked because of their judgment and their ability to make the right decision. The loadmasters are the same way," Colonel McGann said. "Both positions have to be highly intuitive. They have to be able to think on their feet and they have to be able to make the right decisions." 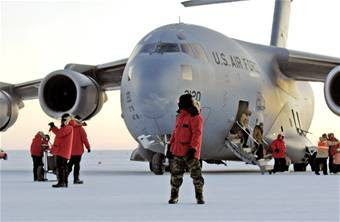 Transitioning McMurdo Station from a quiet, isolated winter camp to a logistical hub for the U.S. Antarctic Program the C-17 had only a short window to deliver its passengers and cargo due to daylight and weather. "The biggest challenges are weather, the complexity of the loads and the time it takes to download and upload the aircraft," said Senior Master Sgt. Jim Masura, the 304th Expeditionary Airlift Squadron superintendent. "Time is limited due to daylight, and we have to get in and out as quickly as we can." The U.S. military is uniquely equipped to assist the National Science Foundation in the accomplishments of its mission to explore Antarctica, and 13th Air Force officials have the capability to provide joint operational and logistical support around the clock. Operation Deep Freeze is divided into three seasons: Winfly, main body and winter. It involves active duty and Reserve C-17 support from McChord Air Force Base, Wash. LC-130 from the New York Air National Guard and other aircraft necessary to support the mission, as well as Coast Guard icebreakers and the Navy Cargo Handling Battalion One to provide critical port services at McMurdo Station. • 11553 kHz for remote-site field parties. • 4770 kHz for Dry Valley and surrounding areas field parties. Mac Ops -- Field Operation Communications Center, second floor of Bldg 165 at McMurdo. Air National Guard LC-130 aircraft are identified by the call sign “Skier,” followed by a specific aircraft number.Helicopters are identified by the last three digits on the helicopter tail. The digits are always two numbers and a letter.